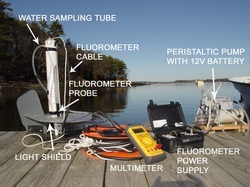 The most commonly used field techniques for measuring seston (suspended particles) removal from the water column by suspension-feeding bivalve molluscs involve taking discrete water samples followed by laboratory analyses. Our lab has developed new protocols using in situ fluorometry and turbidity measurements which provide rapid measurement of seston removal rates. Instruments available to us include handheld units made by SeaPoint Sensors and Turner Designs, and datasondes with multiple sensors made by Eureka Environmental Engineering. These units have allowed us to measure seston removal across a wide range of spatial and temporal scales, and when coupled with GPS to map the “feeding plume” of populations of bivalves at meter-scale resolution. Currently we are using fluorometry in Jamaica Bay, NY with the Hudson River Foundation and at the Sanibel-Captiva Conservation Foundation Marine Laboratory (SCCF) in Tarpon Bay, Sanibel Island FL.